High above the parking lot, World Police Inspector Chisler happens to fly by and notice ‘Soto. Thrilled to finally have the opportunity to bring Gizmo Sprocket in, Chisler pulls in for a landing. The Inspector sneaks up on ‘Soto and, upon realizing that Gizmo isn’t inside, ducks into hiding, threatening the shoot Gizmo on sight should ‘Soto try to warn him. Meanwhile, Gizmo gives the hungry mutt some French fries at the food court in hopes of shutting him up. Eventually, he shoos the pesky creature away out of pure irritation. 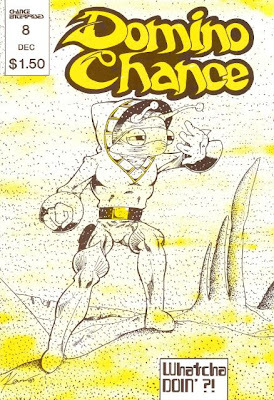 *Domino Chance #8 also featured the main title “Domino Chance” story by Kevin Lenagh and a bonus back cover ad/pinup of Domino Enterprise’s various comic book characters, including Gizmo Sprocket, also by Kevin Lenagh. *The promo for the Gizmo ongoing series from Chance Enterprises titles it “Gizmo Sprocket Esq.”. The “Sprocket Esq.” would be dropped by the time of publication. *Incidentally, despite his prominent role in this story and in the promotional blurb, this would be Inspector Chisler’s one and only appearance. *"Shopping Spree" was reprinted by Mirage in Gobbledygook (Vol. 2) #1. As with the previous story, “Our Hero, Gizmo Sprocket esq.”, Gizmo’s criminal reputation takes a heavy focus; a reputation that would dissolve pretty much immediately after this story. 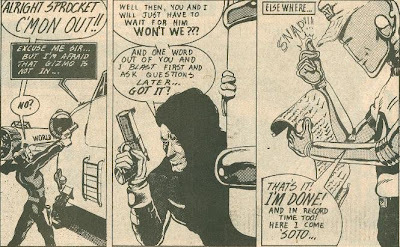 Though I like that Gizmo dropped the “outlaw” shtick early into his comic book career, I do think that there was some potential in the Inspector Chisler character as a returning antagonist, hokey though the “bumbling, obsessed police officer” archetype may be. Maybe it’s because it seemed reminiscent of the relationship between Lupin III and Inspector Zenigata, I dunno. Still, I understand that if you’re going to drop Gizmo’s outlaw status as a plot point, then the idea of a pursuing law enforcement officer would have to be dropped, too. While Domino Chance #7 seemed to have only included the first Gizmo comic as a completely non-promoted afterthought, this issue is positively crazy for the character. The letters page is buzzing with positive feedback for the strip and even ends with the promise of a Gizmo ongoing series. The back cover pinup/ad features Gizmo among Chance Enterprise’s stable of personalities, as drawn by Domino Chance’s Kevin Lenagh. And the opening editorial once again praises the comic and promotes the upcoming ongoing series. Pretty amazing how a back-up comic, shoehorned into the book in perhaps the most unflattering way possible, could have generated such tremendous positive feedback in such a short amount of time. But really, I believe that’s just a testament to the strength of Dooney’s artistic talents and the instantaneous likability of his characters more than anything else. One element I really want to comment on is how great the inking in these comics is. There’s a great balance of light and shadow and Gizmo’s metallic sheen is executed particularly well. Dooney is an accomplished painter and he brings a lot of that skill to his inking. In the letters column, a David Puckett remarks that “Gizmo by Michael Dooney has a fine touch of professionalism” and he definitely had an eye for quality, as Dooney’s strips were a step above most of the other indie publications you’ll find from the era, at least in terms of visual production.